This David and Goliath kids activity works well with any Bible study lesson about David. Spend a few minutes discussing the story of how David defeated Goliath with only a sling, five stones and God’s help. Then tell the kids they too will have the chance to slay the giant. You can prepare in advance by pre-cutting felt into rectangle pieces for each child. Each piece should measure approximately 2" tall and 6" long. Lay the piece lengthwise and cut a small slit on each end (about an inch from the end). Also, cut into each rubber band to make a long straight piece elastic. You will need two bands per child. 1. Take the kids on short excursion to collect the sticks for the base of the sling. Help them each find a small Y-shaped branch. Break down the stick to a manageable size for the child and remove any small twigs, leaving only the Y-shape portion. If a time constraint or the location of the lesson does not permit taking the kids to search for their own sticks, you may elect to prepare this step ahead of time. 2. Help the children thread an elastic band through each slit in the felt piece. Tie the ends of the bands off in a double knot, leaving a long piece of elastic on the other end. 3. Wind the other end of the rubber band around one of the prongs on the end of the Y-shaped branch. Tie it off and secure it by wrapping the area with electrical tape. Repeat the same procedure for the other side. About 1" of the elastic should show on either side of the completed sling. Sketch a drawing of a giant on a large sheet of paper ahead of time, and hang it on the wall. Provide plenty of space in front of the giant. Give the children old piles of newspaper. Have them tear off small sections and crumple them into small balls. These pieces will be used as safe ‘paper rocks’ for the sling. Demonstrate to the children how to shoot and aim with the sling. To shoot, simply place the ‘paper rock’ in the felt portion of the sling, pull back while holding the object, and then release. Line up the children single file and have them take turns slaying the giant by shooting their ‘paper rocks’ at Goliath. To make the activity more challenging, assign point values to specific targets on his body. For instance, Goliath’s arm is worth 5 points, his chest is worth 10, and his head is worth 25 points. Keep a tally of each child’s score and award a small prize at the end. 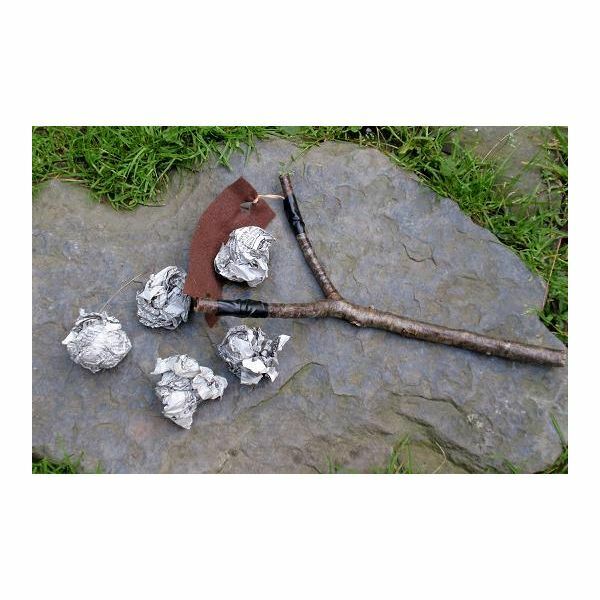 Safety Warning: Prior to allowing the children to practice shooting, discuss safety issues such as always aiming the sling away from people and animals and only using the ‘paper rocks’ in the sling. This series provides fun ideas for teaching children about the Bible story of David and Goliath.